Platanos Machos, a mexican dish made of plantains (plantains are the member of banana family). Here, we are making it in Indian style with raw bananas and orange juice.This is a perfect healthy tasty dessert which is the combination of banana, orange juice, dry-fruits. I gave it the name as “Banana Murabba”. After boiling, peel it and sliced it lengthwise. In a bowl, combine orange juice with icing sugar and 1 tablespoon of sugar and mix it well. Melt 2 tablespoon of butter in 1 tablespoon of oil in non-stick pan (preferably) and place banana slices and fry it from both the sides till golden brown. If excess oil is remaining then drain the slices on absorbent paper. Now add 1/2 tbspn of oil in frying pan and place banana slices in it. Pour the orange juice mixture over it. Cook it on low flame for 5-10 minutes till the consistency of juice thickens and it coats the banana slices from both the sides. 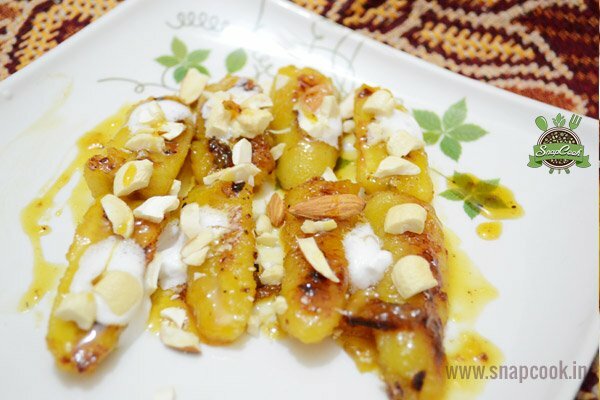 To serve, arrange banana slices with the orange sauce (orange juice thickens = orange sauce)on plate and decorate it with whipped cream and dry fruits and little sugar on top.